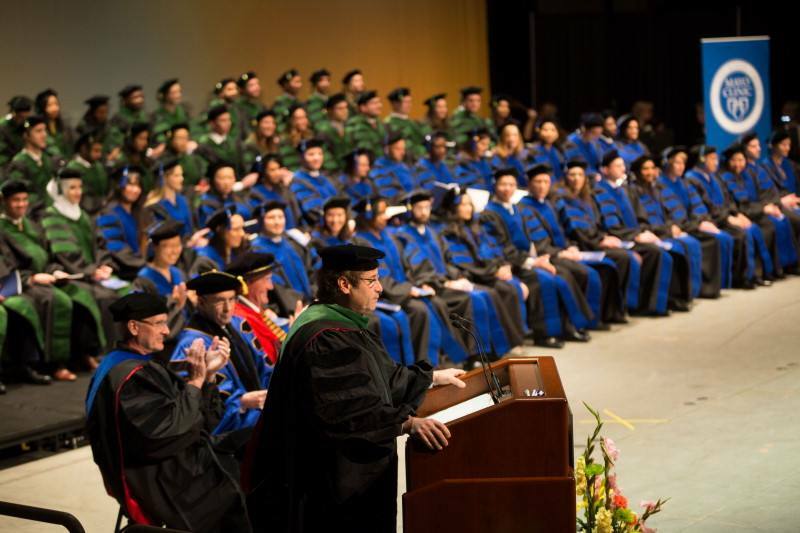 ROCHESTER, Minn. — Students from Mayo Clinic School of Medicine and Mayo Clinic Graduate School of Biomedical Sciences, within Mayo Clinic College of Medicine and Science will take part in commencement events on May 19 at 10 a.m., at the Mayo Civic Center in Rochester, Minnesota. Through the training they have received at Mayo Clinic, graduates will be able to anticipate and address patients’ future needs and lead positive change in medicine and research for generations to come. Media are welcome to attend. Interviews with Cokie Roberts, American journalist and author, Executive Dean Fredric Meyer, M.D., and student commencement speakers will be available to media at 9:15 a.m.
Fifty-two medical students from Mayo Clinic School of Medicine and 22 Ph.D. doctoral students from the Mayo Clinic Graduate School of Biomedical Sciences will participate in commencement events. Students from Mayo Clinic School of Medicine and Mayo Clinic Graduate School of Biomedical Sciences will graduate with M.D. and Ph.D. degrees. Cokie Roberts will provide the commencement keynote speech and receive an honorary Doctor of Letters degree from Dr. Noseworthy. Dr. Waller will accept an honorary Doctor of Science degree from Dr. Noseworthy. This will be Dr. Noseworthy’s final commencement before he retires as president and CEO of Mayo Clinic. Commencement events will be held at the Mayo Civic Center, Presentation Hall, 30 Civic Center Drive SE, in Rochester. Members of the media should arrive by 9:00 a.m. CDT and report to McDonnel Hall at Mayo Civic Center. RSVP to Matthew Brenden, Mayo Clinic Public Affairs, at 507-284-5005 or brenden.matthew@mayo.edu by 3 p.m. CDT on May 18. Mayo Clinic School of Medicine is a national medical school with a four-year medical degree program in Rochester, Minnesota, and a four-year program on Mayo Clinic’s Arizona campus that opened in July 2017. It is ranked #6 top medical school in the nation by U.S. News and World Report. The school also offers a two plus two program enabling students to complete their first two years of medical studies in Rochester or Arizona and their final two years of training on Mayo Clinic’s Florida campus. Mayo Clinic Graduate School of Biomedical Sciences has a distinguished history of preparing students for careers as competitive, independent research investigators. Mayo Clinic Graduate School of Biomedical Sciences offers a Ph.D. degree in biomedical sciences with an emphasis in one of eight areas of research specialization.